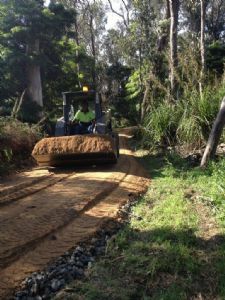 Construction of gravel paths commenced last week as part of the work being undertaken by Bega Valley Shire Council to complete the pathway around Lake Curalo, Eden. The works require the construction of approximately 600 metres of gravel path and 115 metres of footbridge structures. Councillor’s resolved unanimously at Wednesday’s Council Meeting to negotiate with the preferred tenderer for bridge works. When complete, the pathway will continue from the end of the existing concrete pathway at Lakeside Drive to the foreshore reserve at Eden Cove. Completion of the pathway is anticipated by Christmas 2015.